The evening took a relaxed panel format comprising CAMLA committee members Page Henty (General Counsel – Network Ten), Lynette Ireland (Chief General Counsel – Foxtel), Debra Richards (Chief Executive Officer – Ausfilm) and Nick O’Donnell (Regional Manager, Public Policy APAC – Yahoo!7) and was moderated by Anita Cade (Partner, Ashurst). The panellists provided the audience (which included representatives from private practice, industry members, government and academia) with fascinating insights into their career journeys so far and advice to young lawyers considering where their law degrees may take them. The event also included the presentation of awards for the prize-winners in the CAMLA essay competition selected from a record number of entries. First prize went to Christopher Paver of UTS for his essay entitled, The Courts v Twitter: The future of live court reporting in NSW. Second prize was awarded to Jarrod Bayliss-McCulloch of Baker & McKenzie for his essay entitled News Regulation in the Digital Age. Third prize went to Felix Ralph of the College of Law, Victoria for his essay entitled, Anonymity and the Law “The Darknet Rises”. The essays were judged by three representatives from the CAMLA. Awards were announced and presented by CAMLA President Caroline Lovell who commented on the high standard of submissions and insightful views on the chosen subject matter. By all reports the panel presentation, synopses of prize winning essays (and of course plentiful drinks and nibbles) were enjoyed by all, with many looking forward to the next event. A big thank you to Ashurst for hosting this fun and inspiring evening. Thanks also to the CAMLA Young Lawyer committee for organising the event. 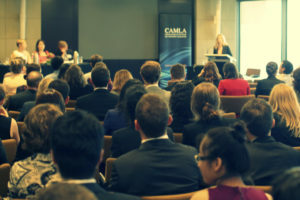 Stay in touch with CAMLA via this website and LinkedIn page for news on upcoming CAMLA events, the Communications Law Bulletin and membership information.